April 2008 - Tenob Marine buys ECL Products. ECL was founded in 1991 New Zealand, manufacturing a comprehensive range of deck hardware including cleats, deck fillers, drain plugs, fairleads, hinges, oar sleeves, key floats and so on. ECL is a perfect fit with much of the product range being complimentary to Tenob's range. November 2007 - Tenob Marine secures New Zealand distributorship for US fuel and fluid management systems manufacturer, Moeller Marine Products. Moeller brings you a total program in fluid transfer and containment. There is a massive range of accessories from their quality fuel fittings to their fuel tanks and much more. June 2007 - Tenob Marine secures sole New Zealand distributorship for Seaworld product. Seaworld brands have high recognition in the New Zealand and international marine markets, particularly in the US. Their comprehensive range of chandlery is now available at marine outlets throughout New Zealand. To view Seaworld product available on this website, type Seaworld into the search box. A great story about the Tenob Rise and Fall Auxiliary Motor Bracket. This bracket was fitted to this yacht in 1987. I have had this yacht for 4 years and love the bracket's ease of use. On the 18/11/2007 in Mornington Vic. Aust. a gale blowing straight into the boat harbour here (winds to 60 knots) broke the mooring on my Adams 10m yacht "Wahoo". 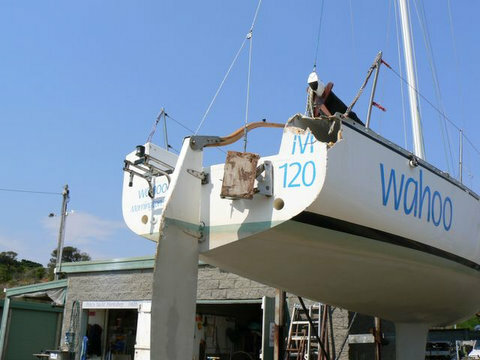 The boat surged back repeatedly into a solid timber jetty and steel ramp in seas reaching 2 metres. yet it held together and prevented the yacht from taking the full brunt of the smashing that was occurring. It is my opinion that had that bracket not been as strong as it is the boat would probably have sunk there and then with much worse damage to the transom and rudder. Thank you for such a fantastic product and I have today ordered another one from a supplier here in Victoria.